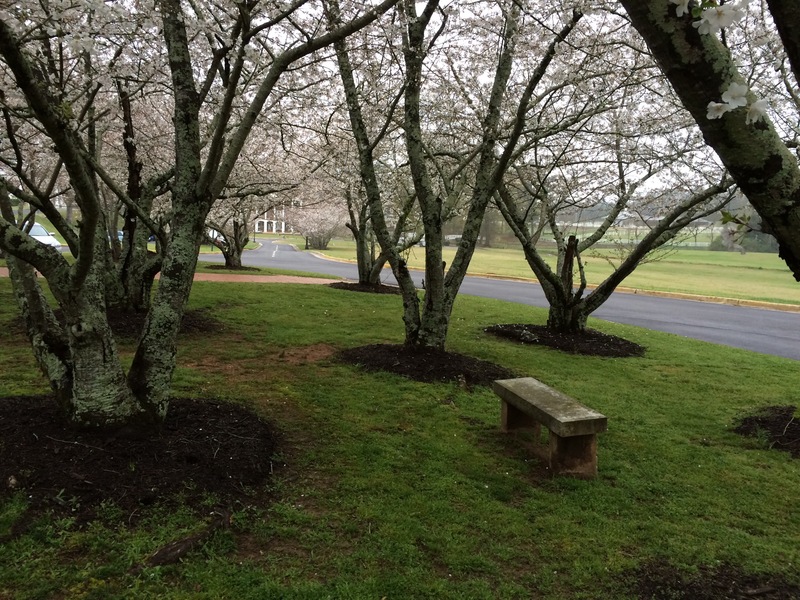 Though I complain about the pollen that turns everything an interesting shade of yellow or green and has my nose and sinuses on the run, little can lift my spirits from the quiet contemplative state of winter like the appearance of the blossoms in the spring. The glimpse of beauty bursting open, seemingly from out of nowhere touches my heart and gives me hope. If beauty can come from what once looked like an old dead stick, well, you can see where my heart takes that. In an effort to share just a bit of joy with you all, I offer you these glimpses I’ve had of such beauty in the past few days. 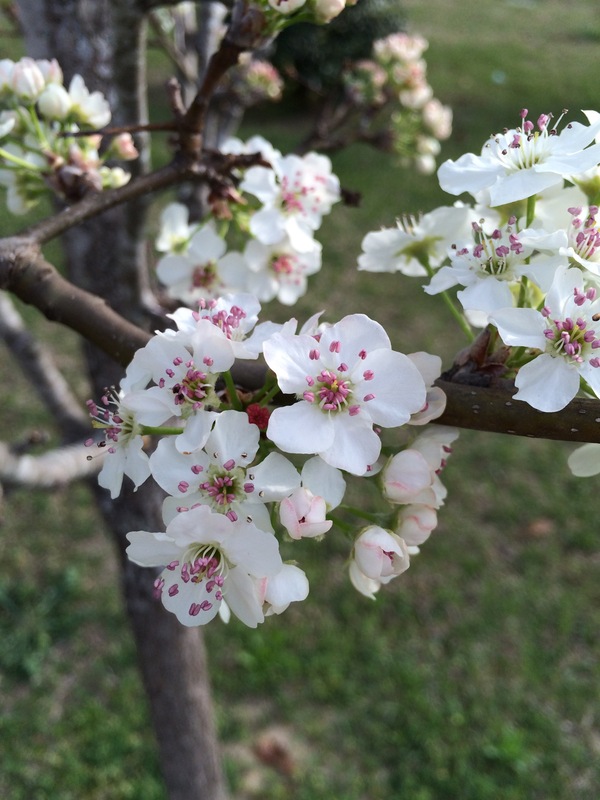 From my Bradford pear–good gravy, I do love those Bradford pears. They are such wonderful divas, so full of color as the fall comes–their glossy dark green dresses turning all shades of autumn. So beautiful that one might think them spent until the following fall. But no, they come out of the slumber of winter all dressed for the dance in their finest ball gowns of white…..
with a tinge of pink. 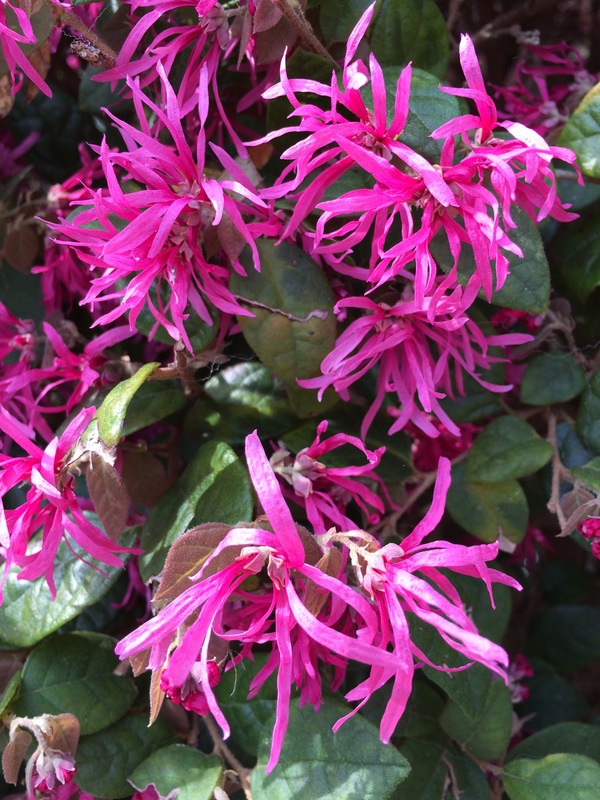 And then’s there’s the Loropetalum. So dainty and exotic looking all at the same time. Glorious color everywhere! She greets me and all who come with her beauty and colorful blooms and leaves. Oh me. My very favorites. 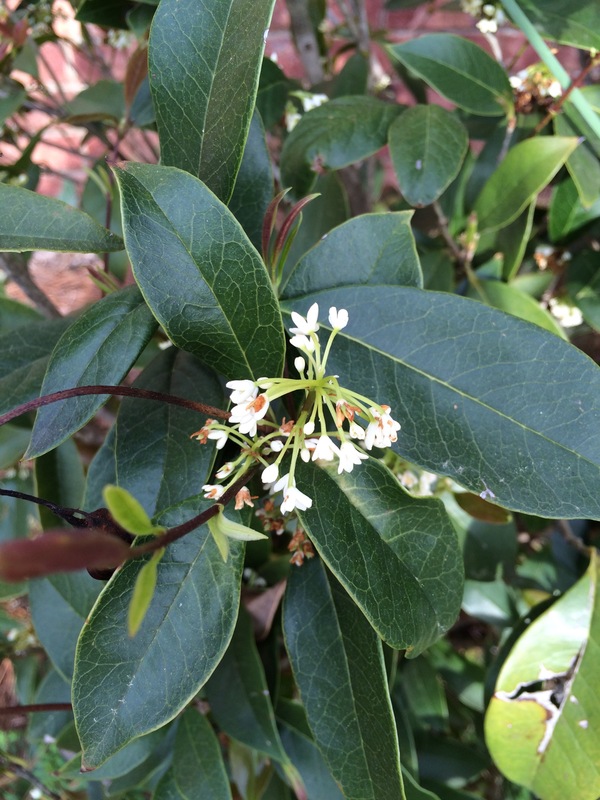 The tea olive, offering up the finest scent from its tiny cluster of blossoms. I once told my Daddy, who had planted the very first one I’d ever met at the corner of the house at Blackberry Flats, that the fragrance from the tea olive was what I hoped Heaven smelled like. It was love at first sniff. I have one by each door into my house, and I often finding myself stopping and taking time to smell the tea olives. Be forewarned, if I’m around one and you are with me, I will make you ask you to smell it. Because when I experience beauty that touches me to my very core, I might just feel compelled to share it with all who cross my path. 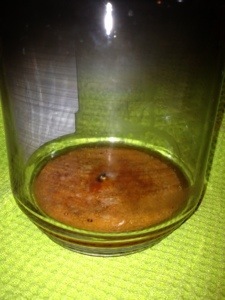 So it is with the tea olive. We planted one out at the cemetery on Daddy’s first birthday after he left this world. I love that I can go out there and catch the delicate perfection that is the scent of the tea olive, while my Daddy is experiencing the real thing firsthand. My little guy and I visited Wesleyan, my alma mater, last Thursday evening. The cherry blossoms were in full force, just in time for the opening of the Cherry Blossom Festival. 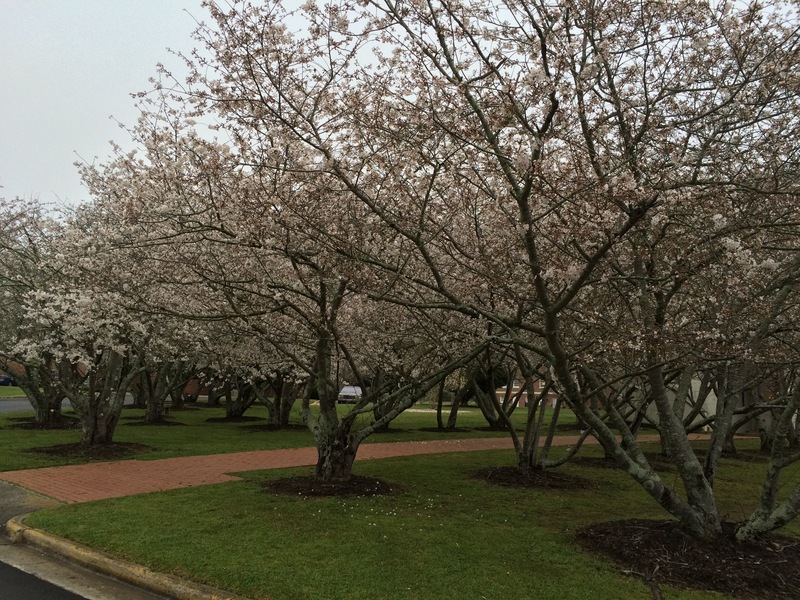 This group of beautiful trees stands close, tucked away behind Candler Alumnae building. As we walked through the trees, I remembered an evening just about twenty-five years ago exactly, when I had made myself a sandwich in my room and walked out to sit on that bench at dusk and contemplate the changes that were about to come in six weeks and some odd days–graduation and all that followed. It was the “all that followed” that I wasn’t very sure about. It scared me, but I remember finding peace and hope sitting there, hidden and protected by the umbrella of blossoms. Oh and the Geese. On front campus. They aren’t the friendliest of sorts, much like other creatures we are starting to see as the weather becomes a little less frigid. 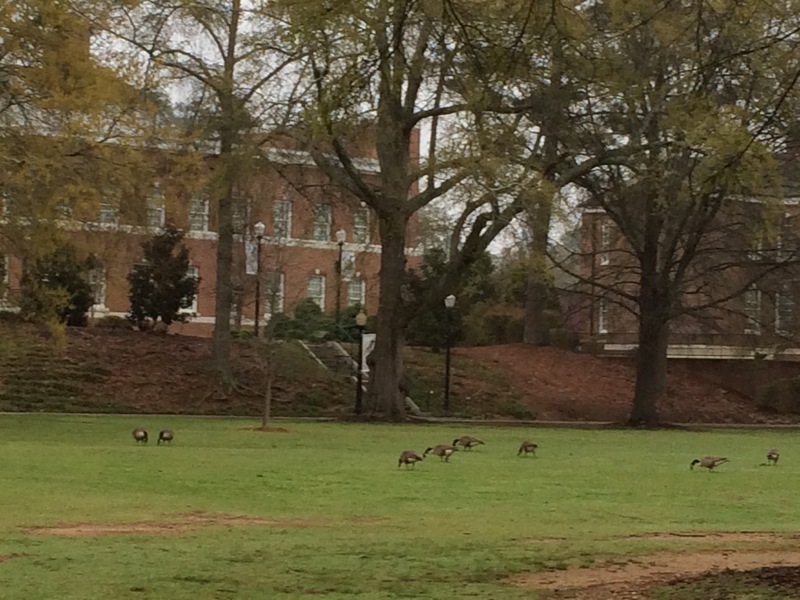 And I realize they aren’t really signs of spring, but they always make me smile and I am reminded that I am not alone. May you all find something that ignites the hope that lies deep within you. 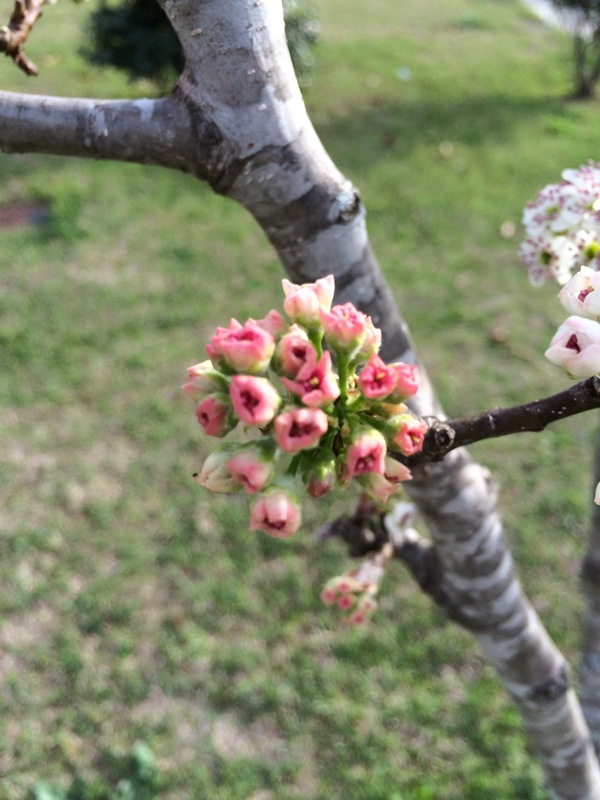 And may it open and blossom just like the buds on the Bradford pear, the grande dame of the seasons herself. Love and hope to all.